Mary Ellen after a blended learning panel talk at MIT. 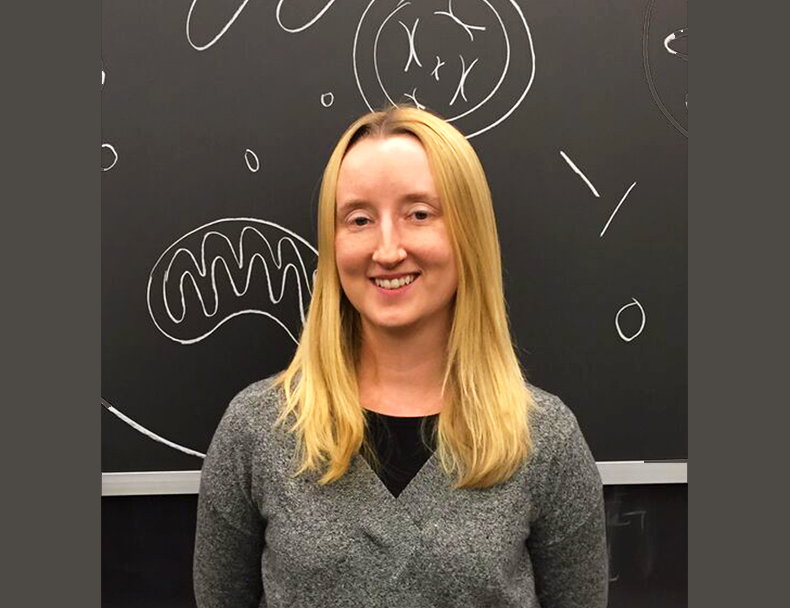 Interview with Mary Ellen Wiltrout, MITx Biology Digital Learning Scientist and Curriculum Development Specialist, highlights the importance of sharing career interests, maintaining connections, and acquiring specific skillsets for a successful career in science education. When did you know that you wanted to have a career in science education? I definitely knew when I was a TA [teaching assistant] during my senior year at Carnegie Mellon University. It wasn’t that I planned on teaching being my career, but I liked teaching more than laboratory research during those semesters. My undergraduate advisor originally dissuaded me from teaching and told me that I should just do research because that is what graduate schools care about, but my mentor Beth Jones supported my desire to do both, and she encouraged me to apply to MIT for graduate school. I pursued a PhD with Graham Walker as my advisor, because I knew he would support a career in education. What skills are needed to transition into a career in education? I think it’s really hard to just transition from research into the teaching path. So during your graduate school and postdoctoral years, you should also try to get the necessary experience outside of lab that is important for the path you want to pursue. I think it’s now challenging for people with only the traditional research career training to even get into the teaching field. We see people committed to this career path that are already steps ahead when they apply for a job because they took a course in STEM teaching or participated in extra teaching activities, etc. What additional training did you complete before taking this job? After I graduated with my PhD in 2009, I got a preceptor position at Harvard University, so I did not do a postdoc. I organized TA training programs and participated in an HHMI Summer Institute, where I learned how to teach others about active learning. I wrote the assessments for courses and occasionally taught in the lecture period. I managed a group of ten teaching fellows there for a course with 180 people with lab, which requires organizational, project management, and people management skills. I also developed my own courses for the Harvard Extension School. So together with my previous experiences in undergraduate or graduate school, I developed the needed skills. My day-to-day varies. Sometimes I have meetings with faculty members about a course for our department on campus or with the Office of Digital Learning to discuss big-picture projects, and other times I’m writing proposals or working on course or traveling to a conference. I lead a digital learning group in the department under the guidance of Tania Baker. 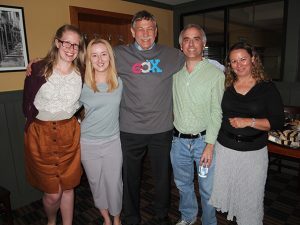 The group started with the creation and continuation of our 7.00x Introduction to Biology MOOC (massive, open, online course) that we shared with the world on edX.org and expanded to developing specific projects for the MIT courses on campus and increasing the number of MOOCs offered from the Department of Biology. I have two full-time postdocs working with me. I train them, review their work, give feedback, and mentor them. Most of the time we’re working to develop the courses the whole way through (writing the assessments, creating video, and translating the content to an online format while applying the science of learning). Our model works well for busy MIT faculty. Occasionally, we also have undergraduates or graduate students working with us part-time. Basically, each day looks very different! Did you feel it was important that you had a network that you reached out to for this position? My career path is a bit different because for my later jobs I wrote the description for my job rather than it being posted. Working in Graham’s lab mattered a lot because he learned early on about the preceptor position through Rich Losick at Harvard. I also knew Tania Baker and Eric Lander through teaching courses as a graduate student. Then it all came back full circle as I ended up back at MIT, thanks to these individuals and others in the now Office of Digital Learning. Always keep in touch with the connections you have made because you never know when those relationships might come in handy. Michelle Mischke was the instructor for the Introductory Biology course at MIT, and she helped with bringing me back in for the edX project and working with Eric Lander. So meeting the right people and connecting with them, having them know what you’re interested in, and also these mentors believing in you and really pushing you, is a big factor in getting to the next step. How do you prepare or overcome the challenges that are particular to the fast pace of science? What treats and necessities do you keep or wish you had kept in your drawer for emergencies? When I was at Harvard, I would go to Costco and get drinks and snack stuff for the TAs all the time. I would keep the supplies in my office because they would come in for a lab course to teach and would be like “oh I didn’t eat lunch, I didn’t eat dinner, but then the course was four hours with no break.” Small things like that helped them get through their teaching responsibilities and helped me too, as it created an environment that is encouraging for work and discussion.